My husband needs to win because he needs to buy a bunch of this soon since he is running out of a lot of his toiletries! 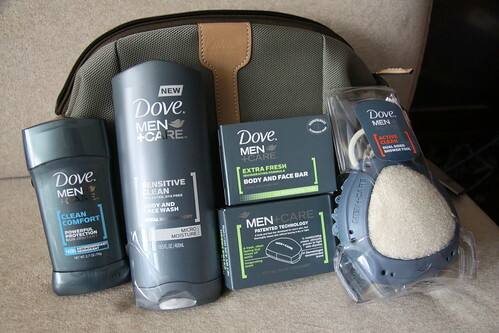 My husband needs this because Dove products would do the job better than whatever he randomly picks up at the store. I woud love him to smell fresh coming home from work, not just going there! My OH needs to win because he is going through so much right now and this would give him a great big boost! this would be great for a friend of mine, because he’s currently going through school to be a fireman! Would love to win this for my Husband. He loves that stuff! My husband would love this but don’t tell him I told you! 🙂 He is need of new toiletries to take to work. My husband needs this because Dove is his favorite! I would love to win this for my husband…he doesn’t like anyone to know it but he likes to smell purty! Thanks! My Husband needs this so I do not have to buy this soon! My husband needs to win because he’s not going to have time to shop for these things when the baby comes. 🙂 Plus we’re a Dove household and we love their stuff. My hubby needs to try something other than a generic bar of soap! I would love to win this for my 22 year old son because he just graduated from college and is looking for a job. He may be traveling for work, so this would be perfect for him! I would love to win this for my husband because he will not use anything other then Dove products and also because he smells so darn good when using them. Brownie points for me, lol. My husband works out all the time playing golf daily, swimming, riding his bike, and playing pickleball. The items in this kit would be a refreshing treat after his daily workouts!